Bollywood actress Kangana Ranaut is known to speak her mind out, no matter who she stands against, she never fails to surprise the audience with her remarks and comments over fellow actors. The actress seems fearless and never stops herself from taking a dig at actors who try to cross her path. Recently, the actress slammed Alia Bhatt by calling her Karan Johar's "puppet". However, while that didn't seem to do it, she even booed Alia's performance in Gully Boy calling it "mediocre". 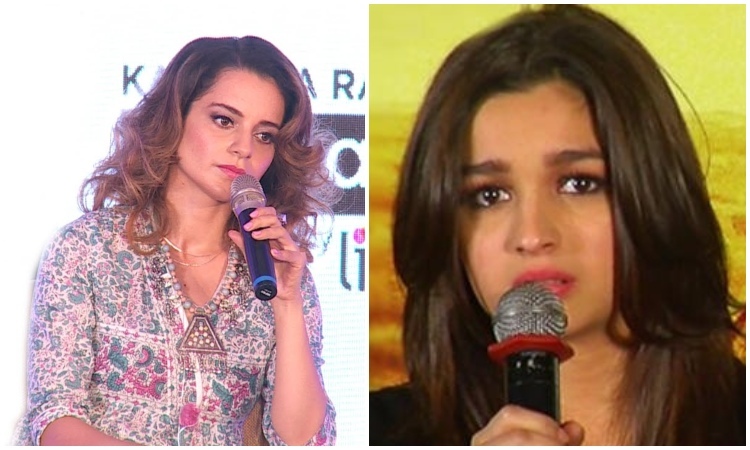 Kangana has targeted Alia Bhatt by saying that during the release of Raazi, she supported her film, but Alia never spoke anything about Manikarnika when the film was under controversy. Meanwhile, Alia mentioned that she never intended to upset Kangana, and she was ready to apologise if she had, the Queen actress went on to calling her Karan Johar's "puppet". During a recent media interaction, Kangana cleared the dust by narrating her side of the story and said, "I reached out to Alia and asked her what makes her think Manikarnika is my personal controversy, it's a film whole nation is talking about and wondering why Bollywood is keeping quiet on such a relevant work...I suggested that she grows some spine and supports an important film about woman empowerment and nationalism...if she doesn't have a voice of her own and her existence is all about being KJo's puppet then I don't consider her successful. I told her if she is only focusing on earning bucks and not raise a voice, then her success has no value." While that wasn't enough, Kangana once again recently ridiculed Alia by saying that her performance in Gully Boy was "mediocre", and she feels "embarrassed" to be compared to her. However, Aliarefrained from making any derogatory comment on Kangana. Now that the tussle between the two doesn't seem to quite down any sooner, Twitteraties have took the discussion to the social media platform extended their remarks about the same. However, many have found Kangana's words for a junior actress extremely rude and uncalled for. A lot of netizens opined that there is no doubt Kangana is a fabulous actress, but it is unfair on her part to make such insulting comments on another actress, who is equally shining in the industry. Some even said that Kangana's apparent hatred for Alia suggests she is insecure due to the latter's success. However, there are many others too who opined that Kangana is right in her words.